I scheduled this interview with Jonathan Newman, Chairman of the Pennsylvania Liquor Control Board (“PLCB”), weeks before the controversy erupted surrounding the rushed creation of the PLCB’s CEO position and former Senator Joe Conti’s appointment to that post. I had planned to fill our half hour discussion on December 20, 2006 almost entirely with the type of in-depth questions only a wine geek would ask, but the politics of the day could not be ignored and Chairman Newman graciously obliged. In his first-ever interview in the blogosphere, Chairman Newman talks candidly and passionately about his principled opposition to the CEO post, the shadow it casts over the continued viability of the initiatives he spearheaded, such as the Chairman’s Selection program, and whether he will remain with the PLCB in light of Conti’s appointment. Chairman Newman also shares his thoughts on the infamous Johnstown Flood Tax, whether it is still illegal to ship wine into Pennsylvania, and what the Pennsylvania legislature should do on the issue of direct shipment. And before the interview is over, he may even have a wine recommendation or two. Chairman Newman, welcome to PhilaFoodie. Thank you for taking the time out of your busy schedule to talk with me. I know that you conducted an online chat on the eGullet bulletin board back in the day, but have you ever been interviewed on any blogs? I have a lot of respect for blogs. I think blogs have transformed the atmosphere of communications in Pennsylvania. This is actually the first such time I’ve participated in an interview in this format, so glad to do it with you for the first time. I’m honored, Chairman. Thank you. Before we talk about wine, I’d like to talk a little about the PLCB’s newly created CEO post that made the news last week. The PLCB voted 2 to 1 to appoint former Republican State Senator Joe Conti as the CEO of the PLCB. You opposed the appointment and expressed some strong comments about it. Why? It was a bad day for good government in Pennsylvania. I believe in public comment and a chance for media scrutiny. There was no transparency in state government. This was a decision that was a fait accompli by the time the information was given to me. I was given the name on Monday afternoon. I was given the job description and salary amount Tuesday afternoon at 3:00 o’clock and was supposed to rubber stamp it at 10:00 a.m. on a Wednesday board meeting. I felt that, given the dynamics of the Pennsylvania Liquor Control Board, if it was appropriate to search for a CEO, a COO, or a CFO, there should have been an RFP [request for proposal], we should have hired the best consultant to see if this was well-advised. And then if it did make sense, we should have truly done a national search and found the best individual. It was a bad day for state government, and at the end of the day integrity and character mean a lot to me and I felt very strongly that this was a bad move for the PLCB and a big negative for the commonwealth of Pennsylvania. And the reason I have been at the PLCB for 7½ years, and Chairman for 4½ years, is I believe in good government, I like my job, I work hard, I feel like I’m making a difference in people’s lives. The board powers that are mandated are statutory. Board members are meant to work full-time. I put in 60, 70 hour weeks and put my heart and soul into this job and feel like I’m making a difference for Pennsylvania consumers. And I object to the process and the way this was done. Why do you think the Governor’s office rushed this appointment? I don’t know. I can’t guess what the intent of others would be. I certainly have read op-eds throughout Pennsylvania. Every editorial board of every newspaper in the Commonwealth is outraged. It’s been covered extensively on radio, and I know that the public is outraged by what happened. And I’m obviously disappointed that this is what it came down to. But in order to understand the Governor’s intent and what his thinking would be, you’d probably have to ask him or his administration. Certainly, the process was not done well. The PLCB has had record profits. Our numbers are extremely impressive, and I’m proud at the kind of returns we’ve delivered for the Commonwealth. In fact, on a press release approved by the Governor’s office, dated July 10, 2006, Pennsylvania Liquor Control Board announces record sales performance. Last year for our fiscal year that ended in June, for 05/06, we contributed $80 million in profits to the Commonwealth, $315 million in taxes, $18.5 million to the Pennsylvania State Police, for enforcement, $2 million to the Department of Health for drug and alcohol programs and $4.5 million in licensing fees, returning $420 million. Board member Tom Goldsmith is quoted as saying “the PLCB’s strong sales performance benefits all Pennsylvanians.” During the past fiscal year the PLCB will have contributed more than $420 million to the Commonwealth, bringing the total to more than $1.5 billion for the past four years. Expenses have been consistent. For the upcoming year, we’ve kept our expenses very consistent. The only expenses that have changed have been those negotiated by the Commonwealth, which include the licensing discount, which was legislative and signed by the Governor, and wage and other retirement benefits. So, we’ve watched our expenses very carefully. We’re opening big, beautiful Premium Collection Stores, our sales numbers have shown record growth, and I’m proud of our accomplishments. So, as far as intent, I’d be real curious as to what the answer is. Does the PLCB really need a CEO? Well, I wrote the Governor a memo in October of 2005 when I first heard the discussion of whether the PLCB needs a CEO, and it was right after the legislative pay raise fiasco. And I thought it would not be consistent with government to bring in a CEO at a big salary because, first of all, it’s statutorily mandated that such a position does not exist and has not existed since 1933 with the inception of the Board. And I have, for my $65,000 salary, put, as I said, my heart and soul into it. And I have been clear to the Governor and, David, I want to be clear to you. I have said to the Governor every step of the way, written it down, and said it to his administration: I do not want a dime more, I am doing the job that I love, the salary is not an issue to me, I absolutely don’t want anything more. That has been very well documented because I felt like I was doing some good and taking the PLCB to the next level, through all my marketing initiatives, because I care, because I was making a difference. If the position was warranted, there should have been a national search firm brought in to have a competitive RFP to make sure we get the best consultant to see (a) if it’s warranted; (b) if it’s warranted, then you do a national search and you find out the best candidate who’s out there. That’s transparency in government. Not being given the name on Monday, an amount of money and a job description on Tuesday and expected to rubber-stamp it on Wednesday. So, I don’t know that it was necessarily needed, but if a professional was brought in and they made recommendations, certainly the Board should have been consulted during the course of such a process. Such a process did not occur. The Philadelphia Inquirer reported that Governor Rendell was surprised and saddened by your opposition, and the paper also speculated that Rendell might strip you of your chairmanship of the three-member board. Do you think that’s true and have you spoken to Rendell since then? I have not spoken to Governor Rendell since then. When we had our conversation on Monday, I said: Governor, I have some concerns, we need to sit down and talk about this. I would become a paper tiger and not be able to get the accomplishments that I’ve done going forward. And he said: no problem, he would put it together. I had a 3 o’clock meeting with Joe Conti, and Secretary [Joseph] Martz from OA [Pennsylvania’s Office of Administration]. I expressed to them in no uncertain terms why I would oppose this and I felt uncomfortable about it. And they knew based on that meeting that I did not have a comfort level in the process that was happening. The two ways this is being spun is that there are declining profits, and that is far from the case. I can certainly forward to you our balance sheet. We have been a cash cow for the Commonwealth. And the other [way it is being spun is] to say that I wanted this position. I was doing the job required of this and never wanted a dime more from this. It was my love of making Pennsylvania a better wine culture, of delivering value for wine customers, of making sure I looked out for the consumer in advocating direct shipping, Sunday sales, opening our stores on holidays, tastings at stores, being able to sell accessories. So, I am saddened to see the weak response due to my indignation of the process and the way this was approached. I am hoping that the process will be reversed and they will come to their senses and realize this is a bad idea. Senator John Rafferty, Chairman of the Law and Justice Committee, is planning, so far, on conducting hearings at the end of January. Both he, Representative [Ron] Raymond and Representative [Robert] Donatucci, the Republican and Democratic Chairs of the House Liquor Control Committee, are concerned about the process. The questions are: Is it appropriate to take a Board that has statutorily-mandated responsibilities and to have the Board abrogate those responsibilities to a person, giving them day-to-day control over all the responsibilities? Is it remedied by simply saying that that person reports to the Board? If you do something like this to the Liquor Control Board, could you do it to the PUC, to the Turnpike Commission? Could you bring in people at these very high salaries, who have not been confirmed by the Senate, and give them many of these mandated responsibilities? And that’s why I’ve received so many phone calls and support from many legislators who are outraged in the process. You mentioned a lot of the improvements you’ve made at the PLCB. Does the creation of this new CEO position or Conti’s appointment threaten to change any of that at all? Well, I think everything is to be determined. The day-to-day responsibilities have been taken away from the Board and been given to the CEO position. So, therefore, much of my vision, like the Chairman’s Selection wine program, using Pennsylvania’s purchasing power to get great deals for our consumers, and my visions going forward, for example, I had a concept of a virtual store. A virtual store is you could go to the Internet and have access to all the products the PLCB could obtain, items typically that only restaurants could obtain, other items that we have access to. So, if you live in a neighborhood that has a small store, you would suddenly have a huge selection of products available. You could find out about varietals, ratings, wineries, regions, you could keep a library of wines you ordered, you could order those products and they would be available in your store of choice in a very short time period. I think that was something that was due and was a concept that I was working on. But given the way the Board structure sits now, I don’t know that I will have my imprimatur on the future direction. It [the CEO job description] simply says the Board will be consulted on policy and regulatory issues and that this individual would report to the Board. But there’s a five-page description of how he’s taking over all these Board responsibilities. So, I believe firmly in the things that I was doing, making Pennsylvania a more consumer-friendly state, and initiated about 20 different marketing initiatives. As it stands now, given the present structure, I think there’s a real question mark as to what the future vision of the PLCB will be. And, quite frankly, if this decision is not reversed, I will have to seriously think about what my future is going to be because I am very uncomfortable the way things were done, and if the process is not reversed, I have serious reservations going forward. You mentioned that Senator Rafferty plans to conduct hearings at the end of January. Do you think it’s possible that a lawsuit would be filed? I don’t know who would file that lawsuit. I haven’t seen that yet, but I know that Senator John Rafferty is somebody who stands for good government. And he wrote me a letter that he sent to the other board members, also signed by a Republican and Democratic state representative, saying: listen, there’s been no chance for dialogue; we’ve had a good relationship between the PLCB, the Administration and the legislature; consult us; let’s do this in an open process with transparency in government; we’re very uncomfortable about the process. I’ve heard from Republican and Democratic legislators equally expressing outrage. I hope the legislature follows through on this and makes good on the situation, and I certainly would encourage the media and citizens to look into this process and see if this is what they believe state government is about. I’d like to switch gears now to talk about your recent holiday purchasing trip to California. I understand that you are calling this the most successful visit ever to California. Why? I am really proud of the Chairman’s Selection wine program. It’s something that has dramatically changed the way Pennsylvanians purchase wine. The Chairman’s Selection program has now exceeded $70 million in sales. And, essentially, the way the Chairman’s Selection program works is wineries never want to discount their product, but sometimes, for whatever reason, market forces, there’s a ton of product in Australia right now, and when wineries have to discount their products, what they typically do is sell it to restaurants or on cruise ships where there isn’t a perception that they are discounting their product. So, if a winery wanted to selectively discount their product in a market like New York and discount it to Sherry-Lehmann, if Zachys and Morrell are already paying full freight and they see that a winery is discounting to Sherry-Lehmann, that winery has alienated themselves forever with other retailers. But since Pennsylvania is a monopoly, I found a way of using Pennsylvania’s purchasing power to deliver great deals for consumers. This has been written up nationally in publications like the San Francisco Chronicle, which said Pennsylvania’s arguably the best place in America to buy fine wine. When I went out to California, the buzz is out there right now of what the Chairman’s Selection program is doing to create excitement among consumers, so wineries see it as a marketing investment in the Pennsylvania market to get their brands well-known. They don’t feel that they are hurting their products because I am including them in a program where we prioritize those brands in the stores, our employees have tasted those products, we’re creating excitement for their brand names, and since we’re a monopoly, we are in no way harming the marketplace nationally. And now, when they have really good products, they will call me and certainly when I go out and visit, that’s the opportunity, face-to-face, to get the job done. And the recent trip to California is really amazing. The products have all been depleted and the way Chairman’s Selection products move is it creates a treasure hunt atmosphere. And with the inventory that was purchased, between the taxes and everything the Commonwealth will collect on this, we will have made $2.5 million based on these purchases. The wine lovers respond with their pocketbooks and the Chairman’s Selection codes quickly move, so people realize that there is a lot of excitement. That’s what every retailer wants to do—is to have great products in their stores, to drive products in their stores, to move through their inventory quickly. We do not take a larger mark-up on the Chairman’s Selection products than we do on any other product, so we don’t necessarily have an incentive to just sell Chairman’s Selections as opposed to other items. The reason I do it is I feel like I’m making a difference with people. When people sit down at the dinner table, they have a great bottle of wine. I reject over 70% of the wines that are presented to me, and the only wines that are presented to me are wines that show cost-savings, don’t have bad press, and wines that have a good taste profile. So I want to keep the integrity of the program, to work hard to deliver profits to the Commonwealth. And, at the same time, in South Eastern Pennsylvania, we would bleed a lot of business to Delaware and New Jersey, a lot of people would go out of state to purchase product. We are winning the battle of boarder bleed. We have had, three years in a row, over 7% growth. We are on track this year for a fourth record year where we have not seen this kind of sales growth since World War II and the reason is because of the Chairman’s Selection program; because we’re reinvesting in our stores, creating big, beautiful Premium Collection Stores with a great shopping experience; having a wide selection of wine and spirits; training our wine personnel, trying to take them to the next level. A lot of excitement has been created. I’d like to keep this moving forward and that’s why the recent events concern me. Are there any wines that stand out from the recent California trip? Yeah, there are so many. The Freemark Abbey Sycamore, which is a wine that typically sells for $55. This is from the great 01 vintage, $19.99 [PLCB No. 011702]. 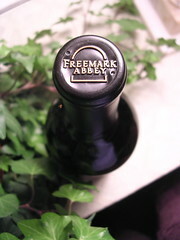 The Freemark Abbey Bosche, a wine that sells for typically $65.00, $29.99 [PLCB No. 011701], and that has a 95 rating from a prominent publication. The Freemark Abbey Bosche, just a beautiful bottle of wine. When I was there, I met with the people who purchased Arrowood as well, and we have some great Arrowood Chardonnay coming in. Grand Archer Cabernet, the  vintage, at a crazy price point of $8.99 [PLCB No. 011551]. David, one of the things that I’m proud of is the high quality of these wines. Let me give you an example. 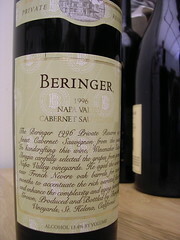 One of my purchases was the 1995 Beringer Private Reserve Cabernet, which typically sells for about $100 to $110 in the marketplace. I sold it for $59.99 through the Chairman’s Selection program. There was a recreation of the Judgment of Paris, a tasting that Steven Spurrier did in 1976. In this new tasting, there were great Bordeaux, First Growths, California cult wines, and the winner was a Chairman’s Selection—the 1995 Beringer Private Reserve. Now, while that’s sold out, I just brought in from the California trip the 1996 [PLCB No. 011302], 1997 [PLCB No. 011307], great vintage, 1999 [PLCB No. 011238] and the stellar 01 vintage [PLCB No. 011685], line priced at $59.99. What a great opportunity for Pennsylvania consumers to try four different vintages of this amazing bottle of wine at that kind of price. But you know what, I’m a value shopper, and I purchase products everywhere from $7.99 to hundred dollar bottles of wine. Just an amazing selection. So, in the past, if you went to our stores, you might see ten Chairman’s Selections at one time. Now, you’re going to see 40, 50 different Chairman’s Selections during the last two weeks of December. Just an exciting time to be a wine shopper in Pennsylvania. How did the PLCB snare 403 cases of the 2004 Clos des Soutyères from Les Verrières? Only 1,000 cases of that were made. You know, that’s the difference in instilling in our wine buyers the fact that we’re a monopoly, that we’re the largest purchaser of wine and spirits in the United States, the largest purchaser of California and Italian wine in the world. And using our purchasing power to drive great deals with the wineries. Because, you know what, David, it used to be business as usual. A supplier would come in and you would simply list their wine and those were the wines available at the store. I try to bring in a good team of wine buyers to get great deals on products, to have people really fighting as consumer advocates. Listen, we still have a long way to go. The taxes are too high. The Johnstown Flood Tax is something that should be visited by the politicians to find a way to make Pennsylvania prices more competitive. I’ve looked at concepts like flexible pricing because certainly our competition in Delaware and New Jersey uses loss leaders to lure in customers and then have high mark-ups on many products. We need to be more entrepreneurial. We need to hunt down these values. That’s where you make a difference in life. Fighting for the consumer, wanting to make a difference in peoples’ lives and being fiscally responsible at the same time. And I really think that we struck that balance during my 4½ year tenure as Chairman. I’d like to talk a little about direct shipment. Pennsylvania’s statutory and regulatory scheme used to prohibit out-of-state wineries from selling and shipping directly to consumers, hotels and restaurants, while allowing in-state wineries to do so. The Cutner v. Newman decision out of the Eastern District of PA declared Pennsylvania’s statutory and regulatory scheme unconstitutional on Equal Protection grounds. However, the decision appears to enjoin the PLCB from enforcing those laws only to the extent that they are applied differently with respect to in-state and out-of-state wineries; it does not appear to enjoin the PLCB from enforcing them altogether. So, what is the state of the law right now on direct shipment? Are all wineries prohibited from selling and shipping directly to consumers, or is it the other way around—are all wineries permitted to sell and ship directly to consumers? David, that’s a great question. I’m going to give you a detailed answer to it. Of course, I put aside a half hour and this will be the last question, but I want to give you my very candid thoughts on the topic of direct shipping. Let me tell you first why I support direct shipping. I think we owe it to the Pennsylvania consumer to give them as many choices as possible. And as much as we are stocking the Wine and Spirit stores, especially the Premium Collection stores, with an amazing selection, there is no retailer in the country that can stock the tens of thousands of wines that are available all over the country. And consumers, especially wine drinkers, want a wide range of products. So, if somebody wants to pay the taxes and have wine shipped to their home, I don’t have any objection to it. And let me tell you the reason. I have four children. I have an 18 year old. I am nervous about everything he does and of every vice that’s out there right now. The one concern I don’t have is that he’s going to be purchasing fine wine on the Internet. So for people to think that this is about wine getting into the hands of minors, it’s a misnomer. The concept is there truly has to be an adult signature required. If not, the shippers and the people who are sending it would suffer very strong penalties, a loss of their reputation, serious fines. And what’s happening right now? People are shipping via brown boxes and it’s being left for minors. So, since there isn’t a vehicle for tax collection, and an outlet for doing this legally, people are bootlegging it, they’re are shipping it in brown boxes and it is getting into the hands of minors, and that is the wrong thing. We work too hard at the PLCB in documenting at the stores, making sure it’s not getting into the hands of minors. And you could set up a system where you are checking to make sure that an adult signed for it and it’s not just being left on the doorstep for kids. Second is the question of tax revenue. Since people are shipping it in brown boxes, there is zero tax collection. So, in fact, I believe this could be incremental revenue to the Commonwealth of Pennsylvania. If people are willing to pay the taxes, want to have it picked up at their home, God bless them. Let them pay their taxes, have the product shipped to their home. As far as what the state of law [is] in Pennsylvania right now: there is no law on the books. And the law has been found unconstitutional. So, shortly the legislature is going to have to take up this issue and deal with it head-on because the law has been found unconstitutional. I know that wineries are very nervous shipping into Pennsylvania right now; nobody knows what the state of the law is. But clearly there has to be legislative action shortly. I don’t know. I haven’t seen anything on it recently. Chairman, I really appreciate you taking the time out of your busy schedule to talk with me here today. History has hosted some classic rivalries: Mozart and Salieri, Edison and Tesla, Coke and Pepsi. Bar Ferdinand and Amada may not be rivals per se (at least nothing beyond your typical marketplace competition). 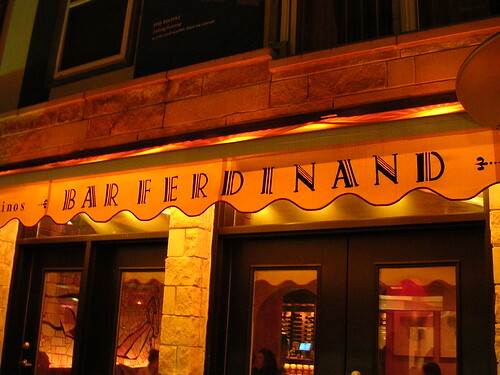 But you almost can’t talk about Bar Ferdinand without comparing it to Amada. 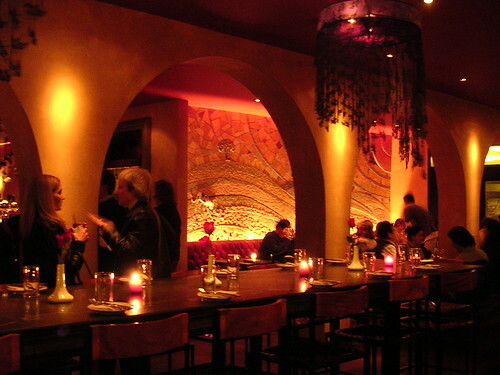 Both are Spanish tapas bars, one of the hot trends in Philly’s restaurant scene. 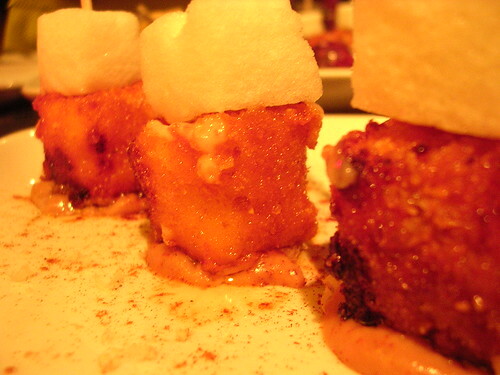 Amada, considered by many to be the yardstick by which other tapas bars are to be measured, was at the forefront of this trend. 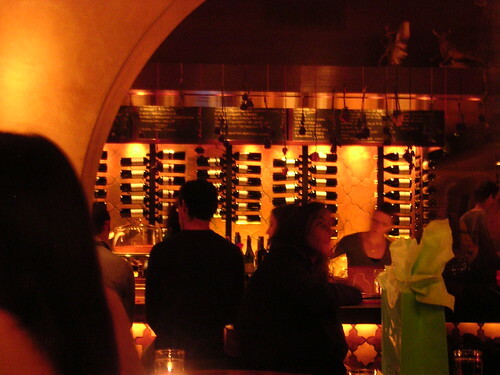 Bar Ferdinand opened shortly thereafter. So, comparisons are inevitable. And much like the classic rivalries noted above, there are strong opinions on both sides of the aisle. First, some of Bar Ferdinand’s offerings are more imaginative and exciting. Because tapas are small and are meant for sharing, you don’t order with same level of commitment you normally have when selecting an entrée. Instead, you’re naturally willing to explore more adventurous and experimental combinations, and chefs will often rise to the task. Bar Ferdinand gets this and, at the same time, it manages to keep its offerings accessible. One dish that illustrates this is the Manchego Frito ($5.00). This dish inventively marries four core elements in the same bite—hot, cold, sweet and savory. First, the back of your tongue finds sweet walnut membrillo puree and the warmth of the fried Manchego cheese, while the front of your mouth feels the cool sweetness of the well-textured frozen apple foam. Next, bite down and the warm, savory cheese fills your mouth. And after its gone, the flavor of cool, sweet apple still lingers on your lips. It's an impressive morsel. The puree, however, may add a little too much sweetness, putting the dish slightly out of balance with its savory core. 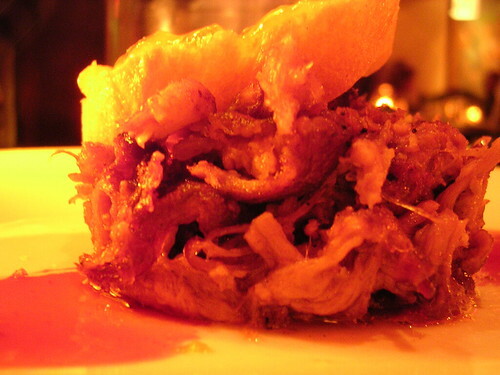 But overall the Manchego Frito is a compelling and addictively satisfying offering. 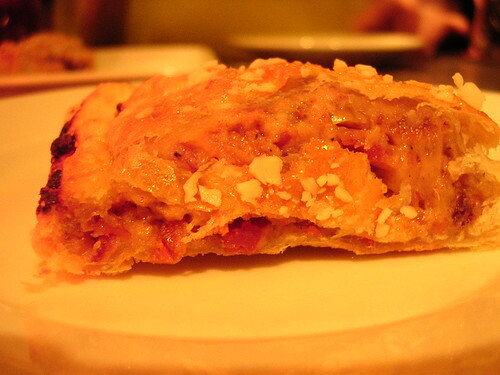 Another example of this is the Datiles Con Tocino—dates, bacon, cream cheese baked in puff pastry ($3.00). This dish combines sweet and savory elements in a well balanced bite. The outside is as sweet as a holiday. The bacon and cheese inside completes the experience, adding a rich, savory element that balances the dish nicely and always leaves me craving another. Other dishes stand out as well. 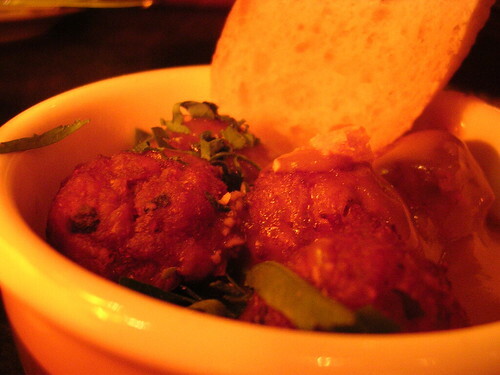 For example, the Albondigas—meatballs made of ground lamb, pork and beef in toasted Marcona almond and sherry sauce ($5.00)—display some nice layering. The dish starts off sweet, then the smokiness of the roasted almonds comes in on the finish. And the use of three different meats creates an interesting and tasty flavor. There is room for improvement at Bar Ferdinand. For example, the Pato Confitado Con Sangria de Naranja ($7.00) is out of balance. The dish is shooting for a balance between the rich, savory duck confit and the bitterness of the orange toast. And it works—as long as the toast lasts. But there’s not enough toast to pair with the mound of rich duck, which can quickly become overwhelming. And, of course, there’s the sangria ($4.00 per glass/$15 per pitcher). 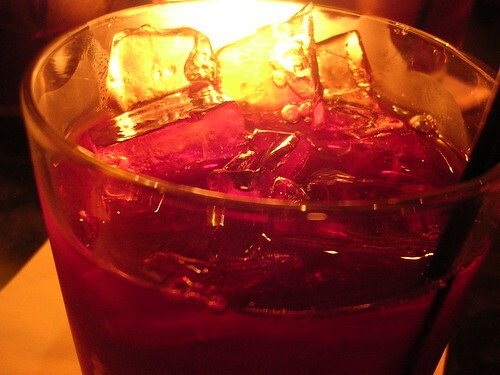 On my first visit to Bar Ferdinand, the sangria was disappointing—it was tart, thin and nowhere near potent enough. Since then, however, the sangria has vastly improved—it has been sweeter and more potent without losing its light, refreshing and natural character. Our server acknowledged that they had been fine-tuning the recipe, and it appears that they’ve found one that works. The second reason Bar Ferdinand is becoming a comfortable haunt, of sorts, is price. Bar Ferdinand’s tapas are inexpensive, and that's the way it should be. Most tapas here are in the $3.00 to $6.00 range, giving you greater latitude to explore more of the menu. And if you try a dish you don’t like, no worries. It is only a few dollars, someone else at your table likely will enjoy it, and the menu has so many choices you’re sure to find something else that fits the bill. Also worthy of note is Bar Ferdinand’s user-friendly wine list. Don’t know much about Spanish wine? Not a problem. For many of its wines, Bar Ferdinand identifies the American or French varietal that tastes similar to the wine you're eyeing. If you enjoy Bordeaux, for example, Bar Ferdinand will steer you toward the 2001 Raimat Cabernet Sauvignon – Costers del Segre, which has a deep flavors of dark fruit with notes of cedar and a long finish. Bar Ferdinand is faithful to the tapas spirit, offering energetic, imaginative and accessible tapas at reasonable prices. And giving us another reason to visit Northern Liberties. So does this quell opinions as to which Spanish tapas bar is better, or stir them? That question, in many ways, misses the point. Coke and Pepsi co-exist on the same shelf. So can Amada and Bar Ferdinand. Philadelphia Magazine surveyed Philly restaurant lovers to uncover their eating habits and dining proclivities. Then, in its annual 2007 restaurant issue, it used these statistics to categorize and recommend local eateries based on these diners’ dispositions. Turns out that 70% of those surveyed get their restaurant recommendations by word-of-mouth. Philadelphia Magazine gets some of its recommendations by “word-of-screen,” so it thought it would direct this 70% toward its favorite Philly food bloggers: Foobooz; Messy and Picky; and, yours truly, PhilaFoodie. eGullet's Pennsylvania bulletin board also gets a shout out for hosting lively restaurant debates. If it didn’t hit your mailbox yesterday, you should be able to find this issue of Philadelphia Magazine on store shelves today. To be quite honest, I was surprised to learn that Craig LaBan—the restaurant critic for The Philadelphia Inquirer—would be appearing live and in person Tuesday evening to give a talk at the Penn Bookstore. Anonymity is a restaurant critic’s stock-in-trade. It is what gives him or her the luxury to experience a restaurant the way we do—in its normal state of affairs with all of its little imperfections on display. In LaBan’s case, if the restaurant staff discovered they were serving the only critic in town who has the power to move the market, things could get a bit awkward. LaBan maintains that he does not need anonymity to craft an effective review—after all, he says, they still have to cook the food, and ultimately that’s the focus of the review. Yet, he has gone to great lengths in the past to protect his identity. One of the most famous examples took place when LaBan won the James Beard Foundation award in 2000, food writing’s most prestigious award; he refused to attend the banquet because the industry reps in attendance would see what he looked like. And so the question became: How would LaBan pull off his appearance at the Penn Bookstore? Would he even show at all? The purpose of this rare public appearance was for LaBan to promote his new book—The Philadelphia Inquirer Restaurant Guide. LaBan’s guide is an essential read not only for those who enjoy exploring the Philadelphia restaurant scene but also for those who appreciate good food writing. As you would expect, the book provides you with all of the utility you want in a restaurant guide, including indices that organize the restaurants by various categories. But LaBan serves up much more. The guide reads like literature. And LaBan is the consummate storyteller, treating you to a level of depth and expertise about the Philadelphia restaurant scene that only he can deliver. LaBan feeds you detailed, eloquent reviews of his 76 favorite Philadelphia restaurants, all of which have been updated for the new book. LaBan’s prose will vividly transport you to his dinner table, his sensory details so crisp and engaging you’ll be convinced you shared the meal with him. In the margins of each of these 76 reviews, LaBan fleshes out the scene even further by delivering bullet point highlights about the menu, the wine list, the weekend noise level and even parking options, among other things. In addition to his 76 favorites, you’ll also find concise capsule reviews of over 600 more area restaurants. But, as a guide, what sets this book apart from the others are LaBan’s essays. 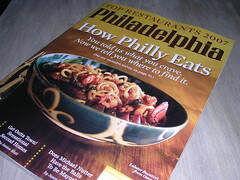 Peppered throughout the book are nine densely informative and richly entertaining essays about features unique to the Philadelphia restaurant scene, including the BYOB phenomenon, truck fare and (of course) cheesesteaks. Digest these and you’ll feel like you own the city. Before LaBan emerged and took the podium at the Penn Bookstore, the buzz in the crowd was all about his identity. And when he did finally appear, he fully embraced the moment, donning a wizard’s cape and shielding his face with his signature baguettes. The crowd laughed as he distributed the bread for us to eat (we were missing dinner, after all), and before we knew it, he had opened his spell book and had already begun to mesmerize us with one of his essays. At that point, the buzz about his appearance was forgotten. All we could see was the Yue Kee truck in University City and the “soft half-moons of violet-skinned Asian eggplants” he was describing. So, the next time you spy a man in a wizard’s cape across the room from you at your favorite trattoria enjoying a whole, grilled Branzino prepared tableside, please don’t stare or call attention to the man. Just let him eat in peace. After all, it could be Craig LaBan. 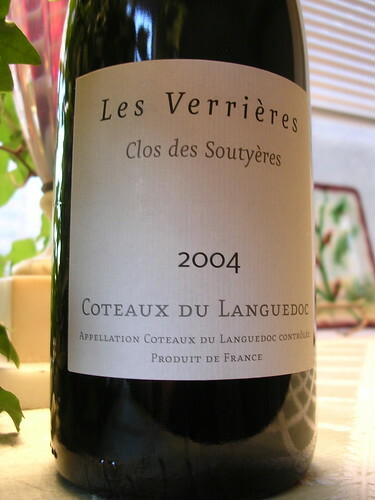 The Clos des Soutyères from Les Verrières hails from within the Languedoc-Roussillon region of Southern France, a region known for producing wines at the value end of the spectrum. It is a blend of Syrah, Grenache and Carignane (the varietal primarily responsible for this wine’s aggressive tannins and 14% alcohol content). This is a bold red. You’ll taste a quartet of darks—dark cherries, dark plum, dark chocolate and dark coffee. The finish is long; the chocolate seems to hang on forever. But the tannins have even greater stamina, tingling your gums long after the chocolate has disappeared. In addition to how it tastes, though, there are two other important reasons you should try this wine. First, it’s a rare opportunity to get a highly rated wine at a very reasonable price. 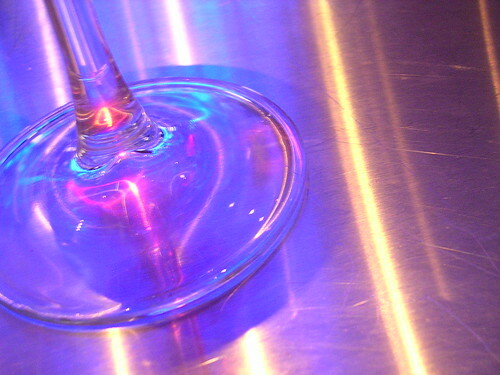 Most wine drinkers, including me, spend a lot of time tracking down great values. And there are some gems out there to be found, even if you do have to sift through a lot of ore sometimes to find them. This is one of those gems. This wine from Les Verrières is not only reasonably priced at $22.99, but it is also highly rated. In August 2006, Wine Spectator rated this wine a 91. To give you some perspective on what a good deal this is, the 2001 Silver Oak, Napa Valley—a highly coveted and insanely popular cult Cab from California—is rated an 89 and the PLCB charges $99.99. Some people dismiss wine scores for being subjective and as being nothing more than a marketing tool. Back in August, the New York Times took aim at 100-point wine rating systems because of how wine marketers have been exploiting them. For example, marketers will often trumpet a 90 but ignore an 89, implying that the scores reflect an objectivity and a precision that even respected wine critics will readily admit (and most intelligent consumers already know) just isn’t possible. Some wine merchants have even been accused of inventing high scores to push their wines, affecting the credibility of wine scoring in general. That being said, a score can still be a useful guide if it comes from a reliable source such as Wine Spectator (Robert Parker’s Wine Advocate and Stephen Tanzer from Food and Wine Magazine are also in that category). And at $22.99, this is great opportunity to experience a 91 from Wine Spectator and incorporate that experience into your wine vocabulary. The second reason you should try this wine is because it comes from a very limited production. The reason this is important, at least for PA wine consumers, is because of what it may represent—progress. Pennsylvania’s wine distribution system has taken its lumps over the years. It has been called draconian and has often been criticized as being antagonistic to wine consumers in terms of price and selection. PLCB Chairman Jonathan Newman has done a lot over the past few years to change that. You still may not be able to buy wine at your local grocery store or escape the Johnstown Flood Tax, but things have gotten a whole lot better. The PLCB is now leveraging its buying power as the largest wine purchaser in the country to get some great deals, some of which it offers as Chairman’s Selections. The PLCB also is now offering more high-end wines, although its buying power does not always have the same muscle at this end of the spectrum (for example, the PLCB charges $135 for the 2003 Chateau Ducru-Beaucaillou, a widely-available Second Growth Bordeaux, but it lists elsewhere for $125). But the one area the PLCB does not focus on is offering wine that is produced in small quantities, which are often some of the most sought-after wines in the world. You can’t blame the PLCB for not pursuing small productions; even in states that have privately run wine distribution systems, a wine merchant can have a hard time landing these desirables. Plus, buying small productions doesn’t seem to fit with the PLCB’s buying model. If you’re buying wine for the whole state (even just the specialty stores), it doesn’t make sense to buy wine produced in quantities so small that you couldn’t offer it in all of your stores. In addition, wine makers that have small productions probably aren’t seduced by the PLCB’s buying power. Even if they had enough product for the PLCB, it’s unlikely that they’d be interested in cutting any sort of deal given that small productions are usually in very high demand, especially if their wine is highly rated. That’s what makes the Clos des Soutyères such an interesting find here in PA. Les Verrières made only 1,000 cases of this wine, which is a very small production. The PLCB not only managed to capture 403 of the 1,000 cases made, but it was able to get them at a discount (it was quoted at $30)—an amazing coup for a wine rated 91 by Wine Spectator. It is possible that the PLCB just got lucky—maybe it inked the deal with Les Verrières prior to August 2006, something Les Verrières may not have been willing to do had the Wine Spectator rating been published sooner. But even if that is true, at a minimum it shows that the PLCB recognizes the value in opening dialogues with small producers and (hopefully) building lasting relationships with them. It is not often that you’re able to find a highly rated wine produced in small quantities at a great price. So, you should take advantage of this opportunity while you can. The Les Verrières - Clos des Soutyères (PLCB No. 20202) is available at the PLCB’s Premium Collection Stores. 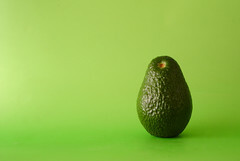 According to an article in Thursday’s LA Times, a California woman filed a class action lawsuit against Kraft for misrepresentation because its guacamole dip didn’t have enough avocado in it. Now, just hold on a minute. I know what you’re thinking—another frivolous lawsuit, right? Wrong. You should be ashamed of yourself. Read the LA Times article. Believe me, you don’t file a lawsuit like this unless you have an FDA rule tucked under your belt telling you exactly how much avocado should be in guacamole. OK, so there’s no FDA rule. No worries. That doesn’t mean the package isn’t misleading. Certainly, for someone to actually file a lawsuit against Kraft for misrepresentation, the label must not list how much avocado is in the dip. Alright, alright. So the package tells you exactly how much avocado is in the dip. But that doesn’t mean she hasn’t been injured. You can’t sue somebody unless you’ve been injured. And I’ll bet you dollars-to-donuts that she suffered some grave and serious injury—one that will tug at the jury’s heartstrings, one that we can all relate to. OK, so…no injury either. Hmm. 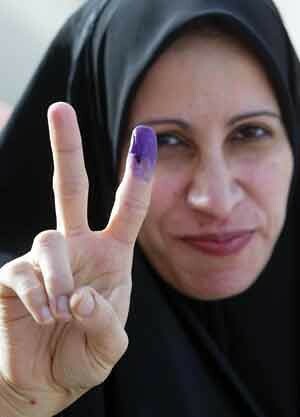 Well, look, don’t judge this woman too harshly. I mean, it’s not like she’s one of those people who has made a career out of suing large corporations. Oh well, Brenda. I tried. 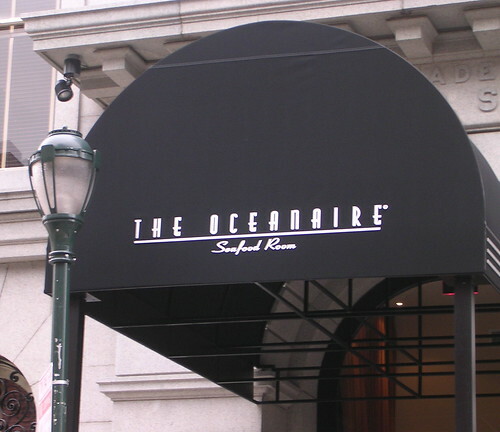 The Oceanaire Seafood Room is a rapidly growing, high-end seafood chain that just docked in the Washington Square section of Philadelphia. 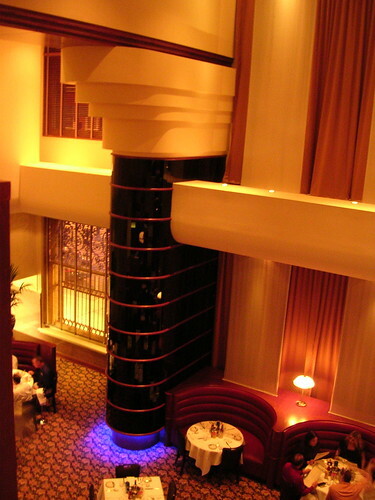 Oceanaire is a unique dining experience, a tribute to a bygone era. 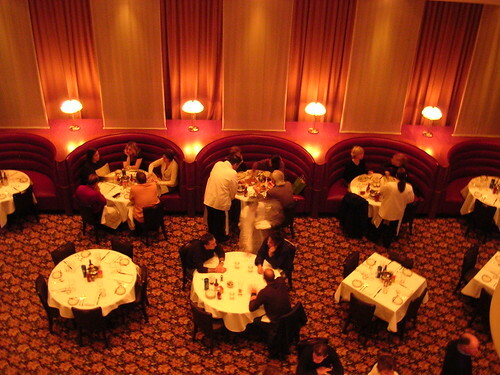 The atmosphere is that of a tasteful 1930s supper club aboard a luxury ocean liner—complete with grand Art Deco curves, cherry wood accents, comfy red leather booths, and big band music drifting through the air. The service, too, is nothing short of first class. Even if you’re not a judge, or a doctor being wooed by a pharmaceutical rep, the staff at Oceanaire will make you feel just as important. But as impressive as the décor and service are, they merely act as a backdrop to showcase the two concepts for which Oceanaire is notoriously famous. First, Oceanaire boasts that its fish is “Ultra-Fresh”—what you’re eating today was likely swimming in the ocean yesterday afternoon. The menu changes daily depending on market availability. Executive Chef Anthony Bonett is in his element; he spearheaded the late Opus 251’s market fresh approach. Given the obsessively high rotation of its inventory, you would be remiss if you didn’t experience Oceanaire’s raw oyster bar, which offers a bevy of bivalves from both coasts. We tried the Effingham, Kumamoto and Netart Bay ($2.10 per oyster). 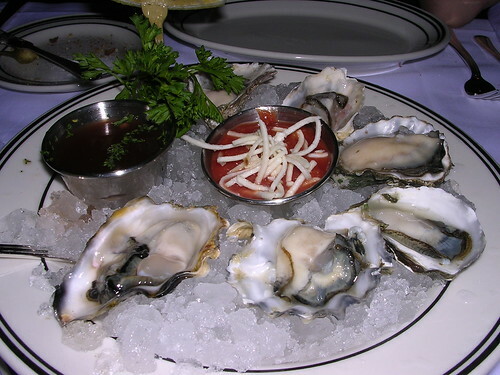 The Effingham were briny and a little sweet, the Kumamoto were rich and buttery, and the Netart Bay were also briny and mild. Another must-have is the Jumbo Lump Crab Cake ($13.50 as an appetizer, around $26 as an entrée). 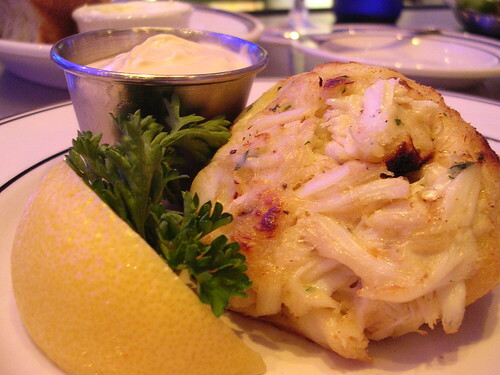 Each hulking crab cake is pure jumbo lump crab meat. There must be some small amount of filling holding it all together, but it’s virtually impossible to detect. The crab cakes are broiled and come with Oceanaire’s signature Mustard Mayonnaise, which adds an addictively rich, zesty kick. Oceanaire’s menu is vast, yet navigable. There are two ways to have the daily catches prepared: (1) simply grilled or broiled; or (2) as one of the chef’s daily specialties. 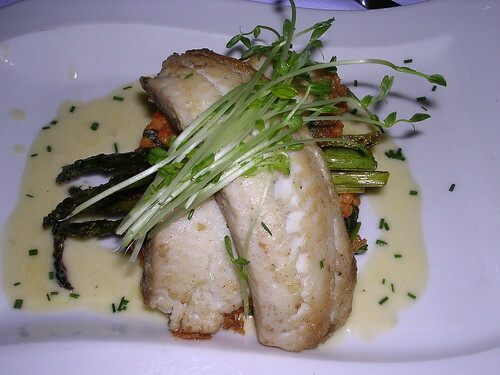 My wife chose the Striped Sea Bass simply broiled ($25.95). From the first bite to the last, the uncomplicated preparation of this dish was a constant reminder of how fresh the fish really was. While the Ultra-Fresh experience may be a lure for many fish lovers, others may see it as an anchor. 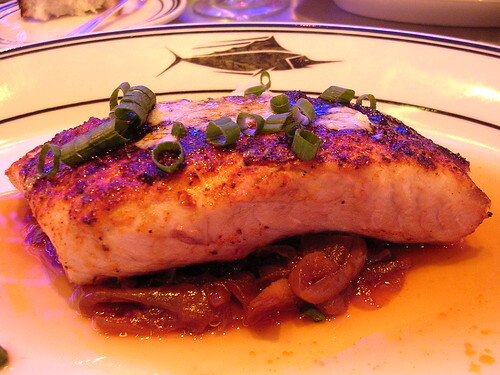 Oceanaire’s fish dishes, even its specialties, are prepared in a way that highlights—or, at a minimum, does not overshadow or compete with—the freshness of fish. However, fish lovers looking for more celestial or sublime compositions may not always be wowed by this approach. 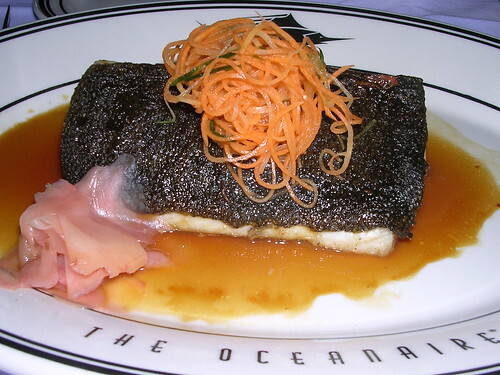 The Black Cod special, for example, was prepared with a light, delicate orange ginger sauce ($28.95). On another occasion I had the Mahi Mahi special, which was rubbed with Cajun spices and accompanied by a dollop of blue cheese ($23.95). The specialties were tasty and merit repeating. However, it would be interesting to see what the kitchen could do if it sailed into deeper waters. The second concept Oceanaire is famous for is that everything comes in only one size—titanic. The entrées are essentially double portions. The sides, which come a la carte, are so large that each one easily could feed a table of four. However, some of the sides (such as the roasted potatoes) are a little too simply prepared and could benefit from some creative chefing. Oceanaire’s bigger-is-better mentality also carries through to the bar, making it a pearl for those hunting for an economical cocktail hour. A glass of 2005 Mark West Pinot Noir at Oceanaire will set you back $12 (only slightly more than other restaurants); however, you’re getting a generous double pour. Similarly, a Chopin martini costs $12.95, but it’s basically a double. It’s also worth noting that Oceanaire’s long, sleek metal bar and its neighboring curved wooden bar are perfect places for those who occasionally dine alone. Oceanaire is among a small, elite group of Philadelphia restaurants that have earned Wine Spectator’s Award of Excellence—which means it has a well-chosen selection of at least 100 wines by quality producers and a thematic match to the menu in both price and style. 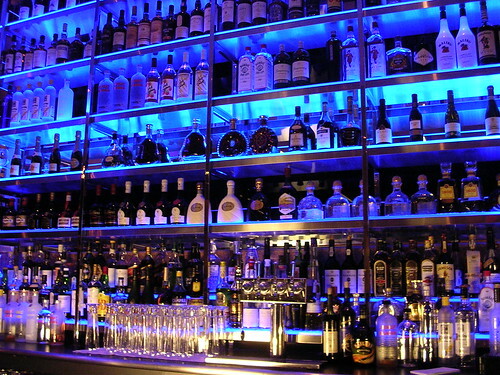 Oceanaire has dozens of wines by the glass and even more by the bottle. There’s even a small selection of half bottles. Oceanaire also has a separate Captain’s List of wines, which has an impressive selection of hard-to-find bottles that hover in the triple digits. 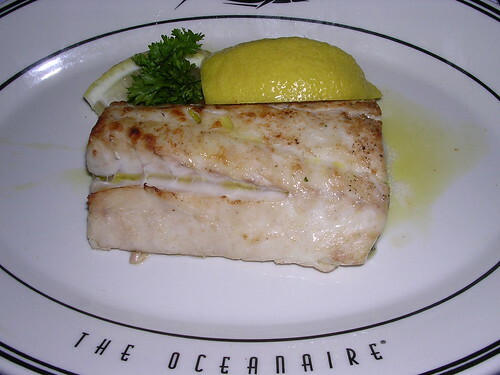 Oceanaire’s Ultra-Fresh selections and gargantuan portions make it a Disneyland for fish lovers. One bite and you could be hooked. Every year on the third Thursday of November the new vintage of Beaujolais Nouveau is released to the public. This year that day was yesterday—November 16, 2006. In France, the timing of Beaujolais Nouveau’s release is governed by law (it cannot be served before 12:01 a.m. on that special Thursday), and its release is celebrated with a certain degree of gimmicky fanfare. 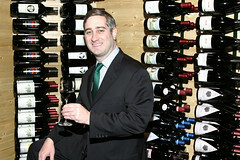 The U.S. also celebrates its release, albeit to a lesser degree, due to an international marketing campaign largely credited to Georges Duboeuf, Beaujolais Nouveau’s largest producer. Beaujolais Nouveau is made from the Gamay grape, which is harvested, fermented, and bottled all in about six weeks. The result is a light, fresh, fruity red. Because this young wine is also relatively acidic and lacks the tannins and oakiness characteristic of many red wines, it is often touted as a safe way to introduce reds to those who prefer white wine. For that same reason, though, some wine purists harbor contempt for Beaujolais Nouveau, calling it Kool-Aid and dismissing the faux holiday that spawns from the Duboeufian marketing blitz. Nevertheless, Beaujolais Nouveau is an inexpensive wine that remains popular, making its way to many Thanksgiving tables every year. It is best served chilled to about 55 degrees. This wine has a short shelf life and, traditionally, it is not consumed after January 1. Although it likely will have a bit of life left in it after the first of the year, by late spring it’s usually too far gone to be enjoyable. 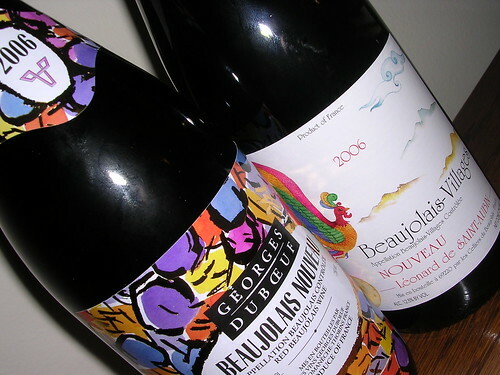 Georges Duboeuf Beaujolais Nouveau 2006 (PLCB No. 5877, $11.99). The color is a deep red. The nose and palate show strawberries, raspberries and cherries. This Beaujolais Nouveau is much heartier than I expected and has a respectable balance between the fruitiness and the acidity. The finish is remarkably smooth. Leonard de Saint-Aubin Beaujolais-Villages Nouveau 2006 (PLCB No. 8998, $11.99). Beaujolais-Villages is a separate appellation unto itself. It is known for producing a Nouveau that is firmer and more robust than your standard Nouveau. The Beaujolais-Villages Nouveau typically lasts a little longer, too. Last year, the Saint-Aubin was my favorite of the two because it had a bright, explosive cherry flavor and a charming bite. This year’s Saint-Aubin, though, is less impressive. Compared to the Duboeuf, the color is lighter and the palate is thinner, grittier and more tart. Cherry remains the principal flavor, but it’s not as explosive as it was last year. More importantly, unlike last year the fruitiness of this year's vintage is somewhat masked by its forward acidity. That being said, I still lean toward the Saint-Aubin. The Duboeuf is probably more approachable due, in part, to its balance and smooth finish. But the Saint-Aubin’s rough edges have a certain appeal. The Debut of Fork You! The blog is less than a day old and has only one post under its belt. But it may already be the best food blog on the Internets. Two icons of the Philly blogosphere, Marisa (Apartment 2024) and Scott (Blankbaby), have teamed up to create Fork You!—Philly's first food vlog (that's right, folks; the "v" is for video). Fork You! is all about "Food with Philadelphia charm." Their first video podcast teaches you how to make sushi. Marisa walks you though the entire process, from selecting fish at Reading Terminal Market to the proper way to roll it all up. In addition to his production skills, Scott provides witty commentary along the way and even tries his hand at building a roll. These two are a natural team. The second episode has already been shot. Fork You! is must-eat TV. Tune in and see for yourself. Like most people, Daniel Rubin spends his work day in front of a computer scouring the Internets for interesting blogs. However, unlike most people, he actually gets paid to do it—by the Philadelphia Inquirer. He presents his daily findings, along with a healthy dose of spirited wit and wisdom, at Blinq. Today, in a post called Food for Thought, Daniel explores the growing niche of Philadelphia food blogs. The field was barren a little over a year ago, he notes. 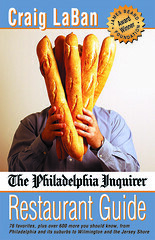 Now, there are more opinionated foodies blogging about Philly restaurants than you can shake a Whiz wit at. Daniel has corralled 8 blogs (including yours truly, a site he kindly says is "something to bank on") and 6 service sites for your perusal. Each one serves up Philly’s vibrant restaurant scene in its own unique way; the perspectives they bring to the table are as diverse and dynamic as the Philly restaurant scene itself. An abbreviated version of Daniel's article also appears here in the Magazine section of the Nov. 15, 2006 Philadelphia Inquirer. Thanks to Daniel for highlighting this little corner of the Philly blogosphere. I’ve added the new faces he discovered to the bulging PhilaFoodie Resources section on the right. So, what are you waiting for? Dig in. Well, folks, much like the mid-term elections, “[i]t was a thumping” here at the Palate Ballot. 1. Bistro 7: 5 votes. 3. Bar Ferdinand: 29 votes. 4. N. 3rd: 0 votes. 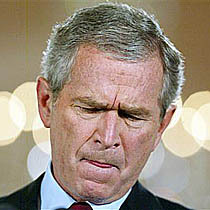 Had the Secretary of Defense resigned sooner, N. 3rd may have had a chance. I guess that was one of those unknown unknowns. Then again, you go with the Palate Ballot you have, not the Palate Ballot you don’t have. Thanks to everyone who voted, especially those who left colorful comments. The Palate Ballot will return soon. 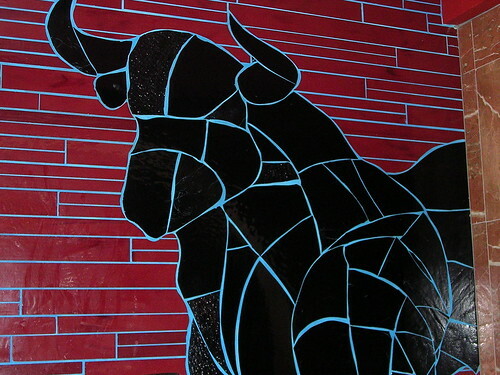 Until then, keep an eye out for my upcoming review of Bar Ferdinand. On the nose: Not a powerful nose. Bright red cherries and oak. On the palate: This Tuscan red is a blend of Sangiovese (85%) and Cabernet Sauvignon (15%). Tart cherry flavors carry the palate. Not overly complex, but some detectable tobacco and chocolate on the finish with a hint of vanilla from the oak. True-to-form for Sangiovese, it has a crisp acidity and soft tannins. A solid performer to be enjoyed now. On the wallet: The Castellani Toscana Biagio 2001 (PLCB No. 005976) is a comfortable $12.99. It is available at the regular and premium PLCB stores. On the table: Sangiovese is tailor-made for food. The higher acidity in this wine makes it a perfect match for tomato sauce-based dishes and full-flavored pastas. N.B. 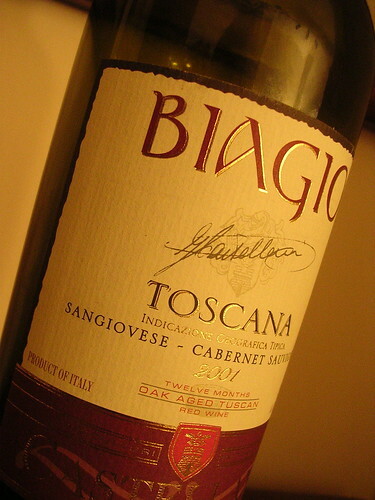 : Keep an eye out for the Castellani Toscana Biagio 2003; Wine Spectator calls it a Best Buy and rates it an 88. If you love Philly’s BYOBs, you’ll love this. The folks at the Philly Tourism Office put together this really cool interactive BYOB restaurant map. Not only does it identify the locations of about 130 BYOB restaurants in the area, it also identifies all of the nearby PLCB stores. You can sort by neighborhood or cuisine. Click on any of the restaurant or PLCB locations and you’ll see a bubble that lists an address, a phone number and a web site (if any). And with the restaurants, you’ll also get a short description. Soon they’ll be adding “send to cell phone” and “get directions” features. It’s no secret that things aren’t going so well in Iraq these days, and in many international circles America’s credibility continues to take it squarely on the chin. But this is a time of year when Americans have the opportunity to restore some of that credibility by showing the world what democracy looks like in action. No, silly—I’m not talking about exercising your constitutional right to vote in the upcoming mid-term elections. I’m talking, of course, about the Palate Ballot. I list four area restaurants in a post. This is called the Palate Ballot. In the comments section of the Palate Ballot, you will vote for the restaurant you want me to review. One vote per person, please. After a designated period of time (usually a week), voting will end. I will then count the votes and review the restaurant that received the most votes. In the event of a tie, I will call a friend of mine who used to clerk for a federal judge, we will go duck hunting and then he will pick the winner. If there is a restaurant you want me to review that is not listed on this particular Palate Ballot, send me an email and I will put it on the next one. 1. Bistro 7 (New American, 7 N. 3rd St.). Although this was on the last Palate Ballot, Matt over at FoodADelphia asked for this to be on the next one, so here it is. 2. Pif (French bistro, 1009 S. 8th St.). 3. Bar Ferdinand (Spanish tapas, 1030 N. 2nd St.). 4. N. 3rd (Traditional American, 810 N. 3rd St.). Voting ends on Tuesday, November 7, 2006 at 11:59:59 p.m. EST. Copper—man’s first metal. It holds a sacred place in our history as the first metal to be unearthed and shaped by human hands. Man’s first use of copper, interestingly, was decorative and ornamental. Copper became a vehicle for artistic expression. Its color and malleability inspired craftsmanship. Since that time, however, copper has become more known for its utilitarian contributions to society. Even today, copper continues to show its versatility. We rely on copper to make calls on our cell phones and to access blogs from our computers. For inspiration, though, we typically look elsewhere. Copper is a New American bistro and BYOB in Northern Liberties. The setting is intimate—the front room has roughly thirty white tablecloth, candle lit seats. There is also a back room, which can accommodate a small group or two. The foodsmiths are owner / executive chef Daniel Connelly and chef de cuisine Todd Braley. The kitchen is open and stationed in the front room, inherently making the chefs part of the dining experience. Yet, you barely notice them. Apparently, aside from the help of only one prep person, Connelly and Braley effortlessly manage the entire restaurant all by themselves. And they do it with a quiet, measured synergy. It’s truly impressive. 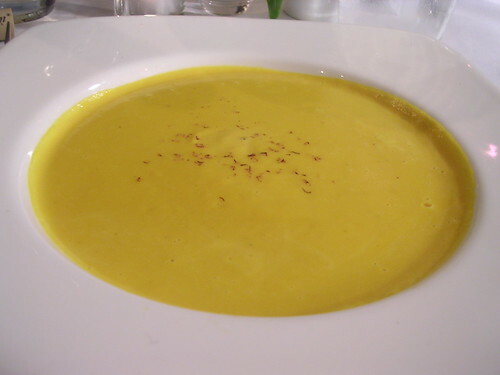 Our first appetizer was the soup du jour, Hubbard Squash Soup with Mascarpone Cheese and Nutmeg ($6.00). The soup was incredibly rich and buttery. Addictive and satisfying at a core level; however, a bit of sweetness would have helped to balance out the richness. 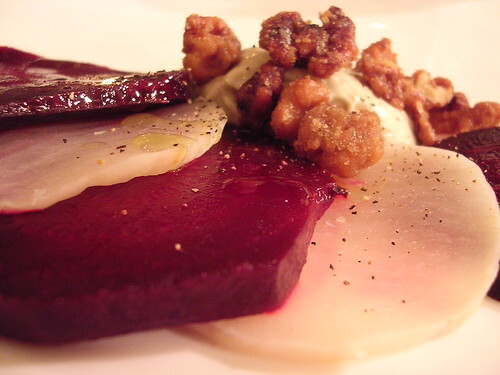 I also ordered the Turnip and Beet Carpaccio with Gorgonzola and Caramelized Walnuts ($7.50). The presentation of this dish was elegant. The rich, whipped Gorgonzola at the center of this dish provided a nice contrast to the cool, comforting root vegetables. The sugar on the walnuts, which were addictive, was a bit too candy-ish for this dish. A sugar with the depth of honey or molasses, for example, probably would be more complementary to the vegetables and Gorgonzola. 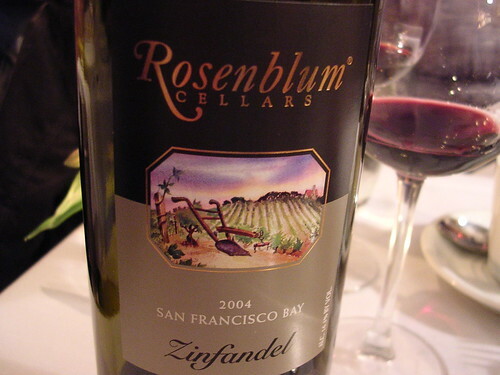 We brought a bottle of Rosenblum Zinfandel, San Francisco Bay Carla’s Vineyard 2004 ($26.99, PLCB No. 13724, Specialty). This wine was deep and bold—black cherry, black currant, raisiny plum and grass. With an alcohol content of 16%, this Zinfandel was a formidable (and enjoyable) dinner companion. For her entrée, my wife ordered the Seared Day-Boat Scallops, Potato Rosti, Wild Mushroom Ragout and Proscuitto Jus ($22.50). 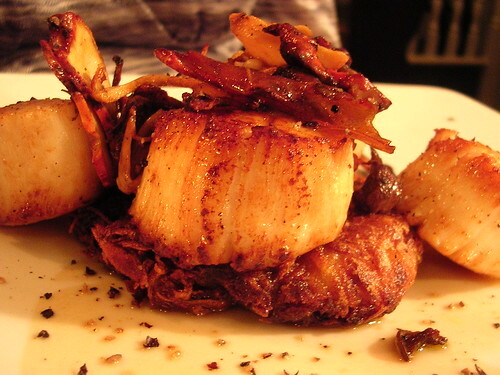 The scallops were perfectly prepared. 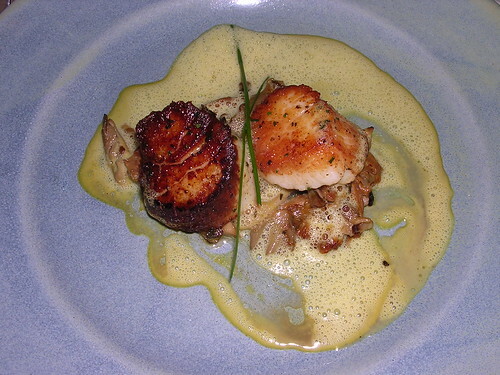 The mushroom ragout was flavorful and earthy, yet delicate, and paired well with the scallops. 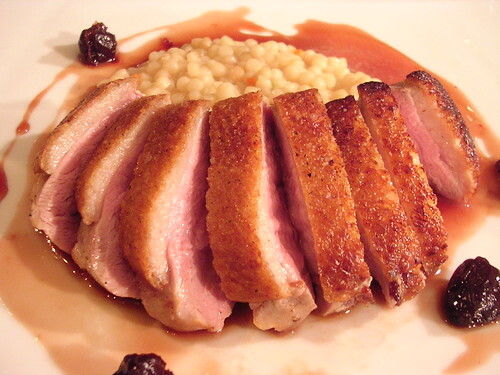 I ordered the Seared Duck Breast with Fregola Sarda and Cherry Gastrique ($21.00). The quality of the duck was amazing—no gamyness whatsoever. Probably the best duck I’ve had in recent memory. This, too, was perfectly prepared. With a duck of lesser quality, one would expect the skin to have been treated to a few more seconds of searing and the meat to be coated in a deeper cherry gastrique. But, given the high quality of the duck, it was wise not to do so here, a testament to chefs’ discretion. 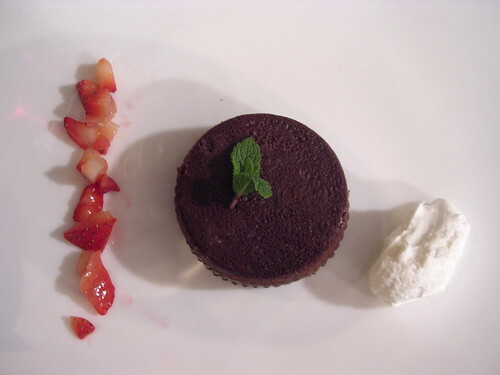 For dessert, we ordered the Flourless Chocolate Torte ($6.00), which I wrote about here in this week’s Culture Shock section of the City Paper. 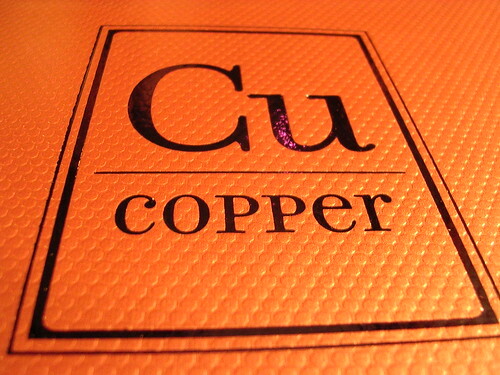 Chefs Connelly and Braley demonstrate that Copper is synonymous with artistry and craftsmanship. Inspiration is just a reservation away. All seasons bring change. But for many people, no season brings changes that are more evocative than autumn's. The days are shorter. There’s a crisp bite in the air. Winter looms. It is a time of new beginnings, too—especially for those whose lives have ever revolved around an academic cycle (or watching football). Autumn is synonymous with the harvest. We set aside time to celebrate the fruits of our labor and explore the flavors of the year’s bounty. Autumn has a distinct feeling all its own. And the one symbol that captures that feeling, and uniquely represents the season of autumn, is the pumpkin. You take on a certain risk naming your 28-seat BYOB after a symbol that is so closely associated with one particular season; some people, after all, aren’t always in the mood for autumn. Chef Ian Moroney does find ways to subtly work autumnal themes into many of his creations; however, he is not a slave to the season. 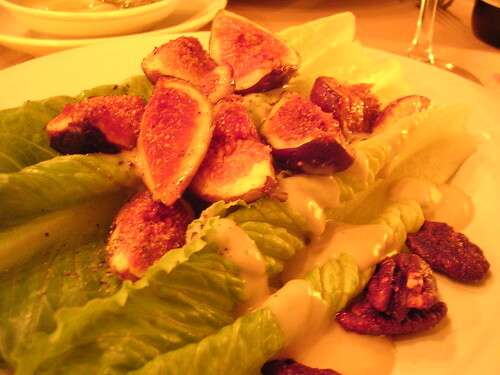 The Romaine salad ($7.75), our first appetizer, included figs and candied pecans, both of which are sweet, rich and flavorful Fall staples. The salad was topped with vinaigrette made from Cashel Blue Irish Farmhouse Cheese, a semi-soft blue cow’s milk cheese from Tipperary Ireland, giving the salad a slight touch of the comforting richness you seek out in the cooler months. The second appetizer was the seared scallops, which were served floating on top of a mushroom fricassee and surrounded by a butternut squash emulsion ($9.75). The mushrooms had a deep, smokey flavor that made me nostalgic for an evening in front of a campfire. The entrée I had was the pork two ways with a pear confit, fingerlings and cider sauce ($22). 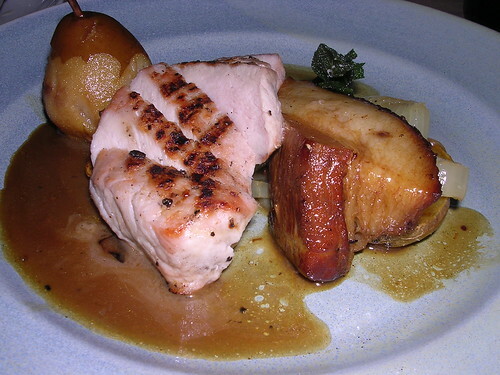 The larger piece of pork was the broiled loin, which was juicy, sweet and tender. The other was the braised belly, the part normally cut into bacon. This slightly darker meat was wrapped in an intimidating ribbon of fat. But the intimidation spilled away as it instantly liquefied in my mouth, stimulating parts of the brain where the caveman and the addict lurk in all of us. 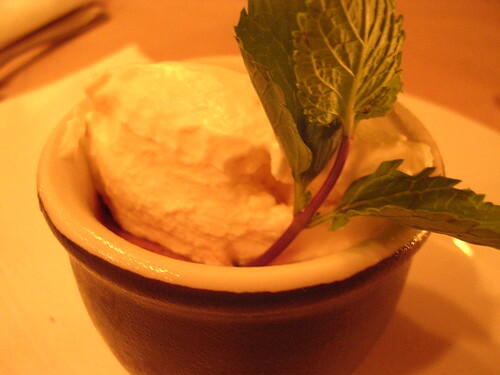 For dessert, the pot de crème ($7.50)—a dessert I’m pleased to see is becoming ubiquitous in Center City. Pumpkin separates itself from the pack by adding milk chocolate and coffee. The milk chocolate gives it a smooth, silky texture some of the others may lack, and the coffee allows you to pretend you’re a grown-up while you're reliving the decadence of youth. Pumpkins make their appearance only in the fall and are around only for a short time. 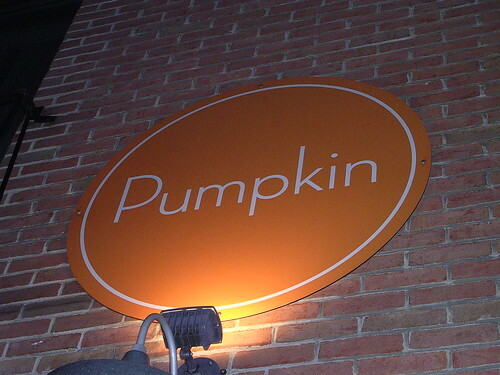 But this particular Pumpkin is a reasonably priced treat you can enjoy any time of the year as many times as you like—assuming, of course, that you make reservations. Another Restaurant Week here in Center City has come and gone. As always, the draw of this event is the chance to get a three-course meal at a chic Center City restaurant for only $30. Getting a good meal, though, can be a serious challenge. The reason this is so is because not all restaurants take the same approach to Restaurant Week. Some restaurants see it as an opportunity to shine and showcase their cuisine. Others, however, are only trying to cash in. In addition, some restaurants, for whatever reason, serve only their limited Restaurant Week menu (which I previously complained about here), depriving customers of the opportunity to experience their more celebrated fare. And, of course, there’s always a chance that the hungry throngs will overwhelm the restaurant’s staff, affecting the quality of both the service and the meal. 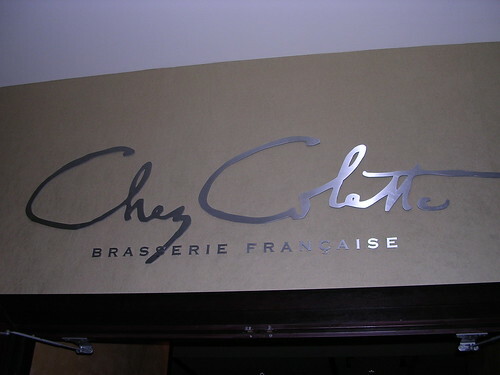 During this Restaurant Week we decided to try Chez Colette, a French restaurant located in the Sofitel. Chez Colette wasn’t necessarily my first choice (I waited a little too long to make reservations), but I had heard some good things about it so we decided to give it a shot. As soon as we arrived at 7:00 p.m., though, we immediately noticed two things: (1) the place was empty; and (2) they were only serving from their Restaurant Week menu. These were not encouraging signs. We both started off with a cup of the French Onion Soup. The soup was light and not too salty. 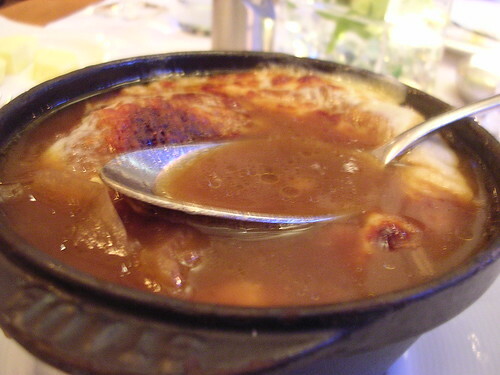 It was topped with a mix of Gruyere and some other type of “Swiss cheese.” However, the other “Swiss” took something away from the punch I’ve come to expect from a French onion soup topped only with Gruyere. 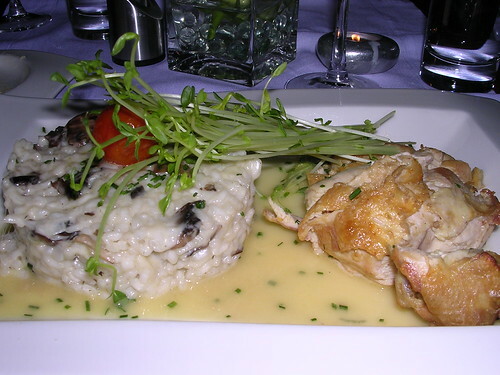 The server recommended the Lemon Chicken Breast with Mushroom Risotto. The entire dish, as you can see, was swimming in an overwhelmingly rich butter sauce, making it rather one-dimensional. Unfortunately, the chicken was dry and overcooked. The Mushroom Risotto, which I assume was the focus of this dish, also was disappointing. It was gummy, and although there were several sliced pizza-style mushrooms mixed throughout, it had virtually had no mushroom flavor at all. My wife picked the Seared Tilapia, Grilled Asparagus Israeli Couscous in a Beurre Blanc Sauce. The tilapia was fresh; however, it, too, was dry and overcooked. The couscous had a nice texture and was well prepared, but unfortunately it was bland. Even just a small amount of spice could have added some depth to the couscous. Finally, we each received a festive dessert trio: Raspberry Sorbet on top of a Meringue Cup, a Lemon Tart and a Coco Loco. 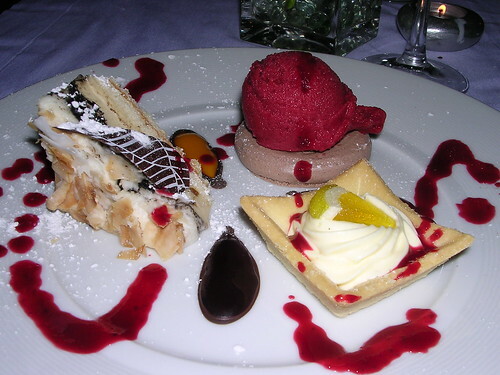 The sorbet—my favorite of the trio—was an explosive burst of fresh, juicy raspberries. The meringue underneath was crisp and airy. The Lemon Tart was light, tasty and refreshing. The Coco Loco, a small wedge of cake densely packed with coconut, had a bit too much coconut for me. My second Restaurant Week experience was unplanned (hence, no pics). A friend of mine and I grabbed a drink at Washington Square after work. In February I enjoyed Washington Square during Restaurant Week, so I wasn’t planning to hit it this time. But we got hungry at the bar and decided to order from the Restaurant Week menu. Here’s a tip for the next Restaurant Week: If you weren’t lucky enough to get reservations, grab a Restaurant Week menu and just eat at the bar. I started with the Romaine Salad, which tasted just as good as it did in February. This time, for the entrée I tried the Merguez Orecchiette with Spicy Lamb Sausage. The meaty sauce was lightly accented with a touch of cumin, which added a bit of sophistication to this unassuming dish. For dessert, a thick, creamy dollop of silky milk chocolate mousse with a side of rich whipped cream delicately infused with coconut. So, over all, Chez Colette was a miss this time around. Washington Square, once again, was a hit. Ultimately, Restaurant Week may not be the best way to find out what a restaurant is really like. But it definitely will answer this question—Is the restaurant able (or willing) to pull off a good meal under abnormal conditions? Is that information useful? Who knows? But it certainly is fun keeping score. 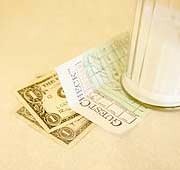 Mandatory Tipping in Philadelphia Restaurants? The Inquirer ran an AP story out of New York on Sunday entitled “Strategies for Getting All Waiters Their Due.” It discussed the measures some are taking to ensure that restaurant servers are being tipped adequately. As an extreme example, the article noted that the restaurant Per Se in New York caused a public outcry last year when it began the practice of automatically charging a 20 percent gratuity, or “autograt” as it is sometimes called, on every single check, not just on checks for large parties. Apparently, at least one Philadelphia restaurant employs the practice of automatically charging a 20 percent gratuity on every check. What troubled me, though, was the way I learned about it. On Labor Day, my wife and I had dinner at Pizzicato at the corner of 3rd and Market. It was just the two of us. Pizzicato is located in a heavy tourist area, so you might not expect that the food would be anything to write home about. But the food at Pizzicato, in fact, is quite good (the sausage ravioli in a rich cream sauce was impressive). When the check came, though, I noticed that a 20 percent gratuity had automatically been added to the bill. I was surprised because I do not believe the menu disclosed that a 20 percent gratuity would automatically be added to every bill. Given that this practice is uncommon, one would expect that a restaurant would take extraordinary care to make sure its customers are fully informed of the policy long before the check arrives. What happened next was even more interesting. Normally, when the server returns with the credit card slip for you to sign, he or she leaves the check in the jacket. In this instance, when the server returned with the credit card slip, the check had been removed from the jacket. The check was the only evidence showing that we had already been charged a 20 percent gratuity, and we did not have it when we were presented with a credit card slip that had a line for a tip. Had I not examined the check carefully when it was first presented, I would have left what would have been a second tip. Granted, there could be perfectly reasonable and innocent explanation for why the server removed the check from the jacket. But the fact that it was missing when it came time to the fill out the credit card slip was troubling to me in light of the apparent failure to disclose this uncommon tipping policy earlier in the evening. I’m sure I’ll return to Pizzicato; the ravioli was good enough to get me back in the door (it was in a cream sauce, after all). Going forward, though, here are a few suggestions for restaurants and customers. Fully disclose your tipping policy. If, for example, you charge a 20 percent gratuity automatically on every check, make sure your customers know about it before they place their orders. Set forth the policy clearly in your menu. Instruct your servers to tell your customers about it. Whatever it takes. You don’t want your customers to be surprised; there are too many other restaurants out there for us to choose from. Keep the check in the jacket when you return it to the customer to get his or her signature on the credit card slip. If you have an uncommon tipping policy, it will help to remove the appearance of any impropriety. Make it your responsibility to learn the restaurant’s tipping policy. Ask about it when you make reservations, ask your server about it when you are seated, and/or review the menu for disclosures about the restaurant’s tipping policy. 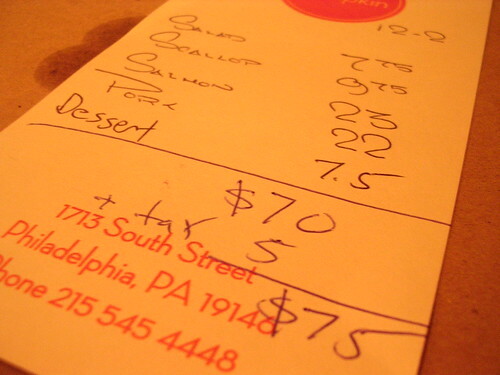 Carefully study the check to determine if a gratuity was added automatically. If it was and you feel that the gratuity is sufficient, just write the word “included” on the tip line of your credit card slip. Finally, leave a respectable tip. The 2007 Zagat guide says Philadelphians are the nation’s highest tippers (19.4 percent of the bill), so I know I’m preaching to the choir. But this reminder may help to keep your name out of databases like this one.